On Monday 5 September 2011, star of Formula 1™ – David Coulthard will be using all his skill from 14 years of Grand Prix racing to power a Mercedes-Benz SLS AMG to victory in what is set to be a dramatic virtual v. reality race. 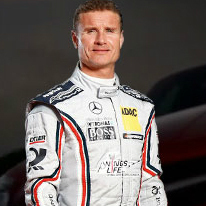 Coulthard will compete in real time, in the same car, on the same track against opponents racing on Gran Turismo®5 – the latest evolution of the most successful and realistic PlayStation®3 (PS3™) driving game of all time. A competition prize draw has been launched to find his challengers. 24 prize-draw winners will enter a qualifying round at Mercedes-Benz World in Weybridge, Surrey, during an exclusive event day. This will include the chance to experience the real and awesome 6.3 litre V8 powered Mercedes-Benz SLS AMG on the brand centre’s unique Handling Circuits. Those who set the top six qualifying times on Gran Turismo 5 will compete against Coulthard, and the clock, in the ultimate final race that afternoon. To give Coulthard and his potential opponents a fair chance at glory, the track will remain a mystery until the day. The final showdown is guaranteed to be a dramatic 15 minute race, where the gamer to set the fastest lap will win an all-expenses-paid trip to the 2011 Brazilian Grand Prix on 27 November. The big race can be viewed live online with live pre-race coverage from ex Formula 1™ driver Martin Brundle, who is most recently famed for his world class motor racing commentary. Live coverage on race day will begin at 3pm at www.mercedesliverace.co.uk. Racers with the dream of competing against the 13 times Grand Prix winner can enter the prize draw at www.mercedesliverace.co.uk. Prize draw entries close at 5pm on the 22nd August 2011. Entrants must hold a full UK driving licence and be available to take part in the race day event at Mercedes-Benz World on 5 September. Full terms and conditions apply. Owners of the Gran Turismo 5 game who do not win the prize draw will be able to test their own driving skills against 13-time Formula 1™ winner Coulthard when details of the track and car set-up are revealed on the day. With over six million copies of the game having been sold since its November launch, the event could become the world’s biggest ever race. Why pick the BMW 5 Series Gran Turismo? Venezuela, at least you know when you’re being robbed!